It's certainly been a while since we last spoke and it's about time that I start writing once again and fill you in with everything that's been happening lately. Firstly, I have officially finished school not just for Summer but forever. In many respects it's a relief to be closing a door on that part of my life as it's been a challenging number of years in regards to education. I will however miss my amazing tutors who really brought me out of my shell and helped boost my confidence as well as teaching me the most amazing skills in art and music. Now that I'm finished with school I'm in limbo in many respects at the current moment due to health reasons another of the reasons why I haven't been so active on my blog. Since the beginning of the year I've been suffering from non stop UTIs and have been on a number of antibiotics to fight against them. Unfortunately, I'm not quite out of the woods yet as although there is no longer signs of infection I am still suffering from various symptoms. Having been on various painkillers due to my chronic pain condition for such a long period of time it was a concern to me that perhaps they could be causing me such symptoms as I tend to keep a close eye on the literature accompanying the medication. After expressing my concerns to my pain management consultant he felt that it would be beneficial for me to see a specialist in that field however it could also be down to the fact that my nervous system is so sensitive that any pain and discomfort could be increased and last much longer than the actual infection itself. So due to this I haven't been feeling my best in recent months and have taken a step back from things to allow myself a break. My plan is however to start writing more frequently once again now that I have more time to spare. One of my biggest aims is to redesign my blog and give it a brand new look. I'm currently looking into this and hope to get things moving over the coming weeks so please bear with me! I have a number of topics in mind that I hope to cover in the coming months which I feel are extremely important to write about here on my blog that I haven't yet discussed. Perhaps I might even look back at some of my older posts and rewrite them with fresh words and new opinions because like everyone I've become stronger in mind and my outlook towards life is constantly developing. As always my biggest passion and interests are wishing the media world and I must say that I feel all the more determined to make it now than I ever have. It is without a doubt my dream to become a full time radio/TV presenter within the entertainment industry. I spend many an hour watching and listening to various shows studying the best in the industry picking up on their quirks and how they connect with their audience. My Sister and I spent the evening last night glued to my laptop watching the Billboard Music Awards and admittedly, I spent the duration of the event telling myself that one day I could be there presenting and interviewing and I genuinely believe that I CAN make it happen. There's been a couple of occasions in recent years that I've received knock backs that made me doubt myself and even just a few weeks ago I had a slight blip where I felt frustrated and despondent particularly due to the setbacks that having a disability has on achieving my dreams. But the more I've thought about it the more I realise that I can make it! It might be a long, hard ride but nothing worthwhile in life is easily achieved but when I do get there in the end I'll truly appreciate it! One of my biggest driving forces is proving every single person that's ever doubted me or put barriers in my path wrong and for whatever reason that determination has really helped me get my head in the right place again lately. Life is far too short to allow dreams to slip by you so why should I give up the fight? 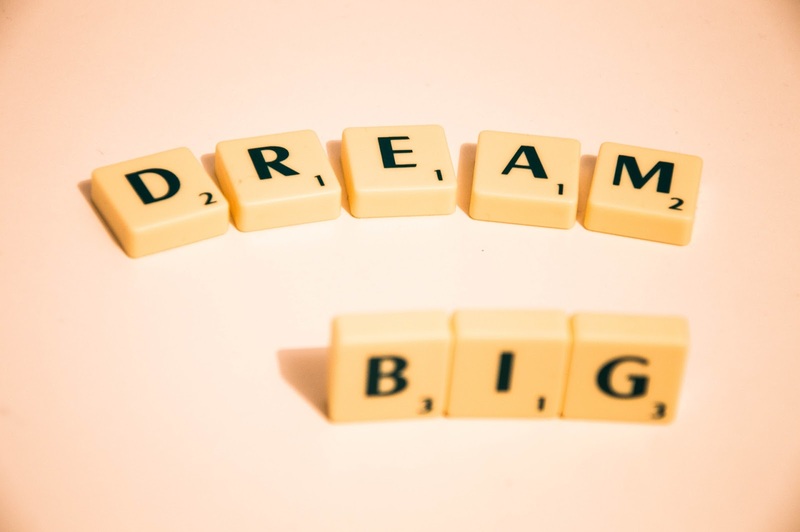 I am determined to make a positive out of each of life's barriers and hope that this post will encourage you to do the same! Please wish me luck as I make my way into the world. This is where all of the hard work begins and one thing for sure is that I ain't giving up until I'm living the dream; my dream! Having grown up with a physical disability I've been all too well aware of diversity and equality issues that arise far too often in society. Sadly, when you're disabled it's a daily battle to live a normal life. Each and every day there's barriers pushed in our direction that the average abled bodied person doesn't have to face. I've been brought up to fight against the barriers and was always told by my parents that I could do anything I put my mind to; perhaps it wouldn't always be easy and that it might take extra planning or a different route to the end result but nevertheless nothing was out of my reach. Never! In fact having a disability has probably made me even more determined to grab hold of everything that life has to offer. Yes, I have my down days but I know within my heart that if I let it run its course I'll be back on track and fighting once again because what else is there to do? I'm 18 years old and due to leave education in just a few months time and am relieved to be doing be so as it's become impossible! If you can't reach the expected high standards, they simply just don't care-but that's a story for another day. Throughout my school life I've attended a handful of schools and my experiences as a disabled pupil have varied. Looking back there was one initiative that really worked throughout my time in education and I'm sad to report that it was scrapped for reasons that I am unaware of. But it worked and I genuinely believe it should have continued to develope across the country. From around the time I was in Primary 3 until I left Primary 7 back in 2011, I attended a small rural school with around 36 pupils at any given time. During my time there an initiative referred to as 'Inclusion Squads' was born. In my opinion it was one of the most effective areas in our education at primary school and I genuinely feel it created a lasting impact. What's an Inclusion Squad might you ask? Basically it was group of pupils in each school who met up on a regular basis to create a plan to promote inclusion and equality within the school for ALL pupils! There was a gentleman from the local council who oversaw the project visiting each of the schools within the area to work with pupils to make the Inclusion Squad ethos a reality. The gentleman just so happened to be an amputee himself so really understood both the importance and the objective of the groups. I've met a lot of really interesting people over the years but he was a real inspiration to me and the other pupils and I know for the fact that his influence created a lasting impact in my life. He worked closely with the pupils as well as our headteacher to create something that should be in every school, workplace and organisation across the world. Sometimes the simplest of things were discussed but that's what made the difference; start small and it all grows from there. Having been involved in various projects throughout my education I can honestly say if one made a difference; the Inclusion Squads certainly did! I genuinely believe this is something that could be established in every school across the world and make a difference in so many lives. It can be the simplest of things such as creating acceptance and understanding for every single person to walk through the door. Then there's looking at the more physical elements such as making the school building more accessible to adapting things such as PE lessons and Sports Day in order to allow everyone to take part. My school successfully did it, everyone was happy and it worked so why can't this be done in ALL schools? Everything accomplished as part of the 'Inclusion Squad' was done in a fun and light manner which made it more appealing. I've been in schools, I know what it's like; there'd be no point in sitting pupils down and making it like another boring lesson. In turn they'll just shut off and what good would that do? Any action needs to be relative to young people in order for it to work; NOT just another lesson! In my opinion, the younger that each individual is educated on inclusion and equality; the better! I would love to see the day where you can enter a room and no one flutters an eyelid no matter who you are or how you look. If children are taught from a young age that throughout life they'll come across many different people from all walks of live and that's completely normal, it'll make a huge impact on society! Education is key for change and it can be done! Love For Live: The SSE Live Awards 2017 Promotional Video Shoot! A few weeks ago I was contacted by SSE and asked if I would be interested in taking part in filming a promotional video for the SSE Live Awards which encourages gig goers to take part in voting for their favourite act who has performed in either The SSE Hydro, The SSE Arena, Wembley and The SSE Arena, Belfast during the previous year. As you all know I am a frequent gig goer and often share my live experiences on the internet so they were keen to talk to me about my live music experiences with a particular focus on seeing Wet Wet Wet live in Glasgow. You all know, that I am a big fan of their music and had a great time at their concert last year so it was a no brainer really; of course I was going to say yes! Fast forward a few weeks and the day was upon us, typically it would be the day of the storm that took place a few weeks ago but never the less we still made it in one piece more or less! The vast majority of the filming would take place in The Clyde Bar & Restaurant, which is located in The Exhibition Centre directly next to The Hydro. The fact that restaurant is surrounded my glass windows meant it was the perfect location to film with The Hydro as backdrop for shooting. The crew managed to snag a section of the restaurant area for shooting to allow space for camera/sound equipment. I was fitted with one of those mic packs that are used in TV frequently and before long I was sitting in one of the restaurant booths looking out onto the Hydro courtyard as filming began. On reflection I am pretty sure we started filming some shots consisting of staring out of the window which was pretty easy-I'm a pro at that hehe! It is however kind of funny being told to move your head in certain directions and keep staring with a series face; that sort of thing. A number of those shots were taken as well as few from outside the window to get a different angle. It's quite an interesting process to watch I must admit. Once this was completed it was time to move on to the interview aspect. I'd been sent over the questions a few days prior to allow me to prepare my answers. We spent a while filming the speaking parts, retaking shots, getting them from slightly different angles in order to achieve the perfect end result. I'd also been asked to bring along various pieces of memorabilia and merch from my gigs at the Hydro which I have plenty of kicking around my room. So we discussed some of the items on film and took some shots of me looking at through them; staring endlessly at the various items. The weather had dried up a little by this point so we decided to take a chance to head outside to get a further few shots. Fortunately the wind and rain stayed at bay for best part of the outdoor shots which consisted of wheeling my wheelchair around staring up at the Hydro some more. However, the wind and rain soon began to pick up which meant a mad rush inside whilst holding onto my hat-priorities right?! Back inside cold and drookit, we took one more further shot for good measure of course and that was a wrap-I think that's the film maker's expression anyway! The video has now been released on SSE's Facebook page which you can view by clicking here. I had such a great day working on the video, the experience was extremely interesting and it's amazing to see just how much work goes into such a short video! Can you believe the video took around 4-5 hours to film?! It was such a pleasure working with the team who were all so lovely and extremely friendly! We were certainly taken good care of and I am most grateful to SSE for this wonderful opportunity! Obviously, the whole point of the video was to promote The SSE Live Awards so if you haven't already voted for your favourite act why not pop on over and do so now by click here! My vote this year goes to Wet Wet Wet, let me know who your vote goes too! On The Look Out For New Bands & Artists! 2017 is now here and I want to start off with new projects and putting more ideas into action. I've been thinking a lot about my ideas and what's important to me I want to work on that throughout the coming year and hopefully beyond. Thinking about my blog, I feel that at present I will continue applying the same method that I've been using for the past while; writing if and when I feel necessary. If something comes to mind or if a personal experience inspires me as it often does I will take to this wonderful little outlet to share my thoughts. If I find myself going somewhere exciting I will of course write about my experiences here on my blog. So really not much is set to change as I have been following this strategy for quite some time as that's what works for me. That does however bring me to my new plans for 2017, as you may remember I ran a music blog for a number of months and the more I think about it the more I realise just how much I miss it. At the time I didn't really have a plan for my music blog so it didn't feel right to continue with it however, number of months later after many discussions and reading many articles I feel inspired and have new ideas. So that is why I've decided to relaunch my music blog; I will let you know as soon as it's live as I'm currently in the process of setting it up and getting to grips with the new blogging platform I've decided to use. Over time I've discovered my passion for the music industry and promoting artists so it's my priority to do my part by promoting new music/upcoming bands and artists as it's something that's extremely important to me. I have a whole host of ideas for other features which will hopefully appeal to a whole host of music lovers; I want to of course celebrate the classics, iconic artists and bands as well as highlighting new music. My younger Sister has introduced me to the world of K-Pop and it really got me thinking about how I could incorporate foreign music from all around the world. This is something that I have no set plan on as of yet however I think there's definitely a place for it in future. Anyway, that brings me to the main reason for writing this post, obvisiously I want to promote new music as well as up and coming bands and artists so that's where I need your help. If you're a band or artist looking to get your music out there or perhaps you know someone who is? Well, I'd love to hear your music! I'm hoping to set up an email specifically for the music blog but in the meantime please get in contact by emailing: thehathippie@outlook.com or get in touch via my blog's Facebook page. In your email please include any links to your music as well as any social media links for your band. Unfortunately, I won't be able to feature every single band nor can I respond to every single email but please know that I really do appreciate you getting in contact! At this early stage I'm only prepping and doing research so it may be a number of weeks before I have everything up and running so be sure to keep up to date with all of my latest news here on my blog and via social media. I promise that you'll be the first to know about any news! Once again I want to thank-you all the for constant love and support, it never fails to encourage me! I genuinely hope that you'll enjoy everything that I have in store for the future-I can't wait to see how it unfolds! Well can you believe that this will be the final post of 2016?! I can't! It feels like just yesterday that we moved house and were ready to start 2016 in our new home-although I was beginning to feel the affects of no internet I must admit! A blogger without the internet is like fish without the sea! What can I say about 2016? It's certainly not been my most favourite of years that's for sure. Lots happened that's for sure and we lost a lot of pretty awesome people! I could easily sit here and list each personally individually and list the reasons why they've made such a big impact but it would take quite some time. I do however want to mention one person in particular whom I am completely gutted that we lost this year; someone whom I admired greatly and this time last year I don't think I would have believed you if you told me that an entire year later he would no longer be here and that is of course Prince. As you've all probably gathered, I am a huge Prince fan and had the pleasure of seeing him perform live just once and had hoped that I would get to see him live again. Sadly that was not to be. I always hoped that I'd have the opportunity to attend one of his legendary Paisley Park gigs or album listening parties that often hosted for fans and although I won't get to experience this I'd love to visit Paisley Park one day! So once again, thank-you so much for inspiring me Prince in more ways than just one! The music will certainly live on! Health wise it hasn't been the best of years for me; the past six months in particular has been a battle for me. My pain levels have been particularly high which as you can imagine is particularly frustrating for me. I've been doing my best to manage my pain to the best of my abilities so as a result I haven't been blogging just as much as I'd like to have. I've only been writing when inspiration has struck and my pain has been minimum otherwise I would have been at it for hours trying to concentrate. However in 2017 I want to get back into the swing of things and write more frequently. I have another post lined up to update you with my blog plans for 2017 so please keep a close eye out for that! It hasn't been my favourite of years that's for sure however there's been a few highlights and despite fighting with pain I've managed to do some pretty exciting things. Well 2016 saw me advance with my radio slot as I hit an entire year at 3TFM! Can you believe it? I started hosting a show on a Thursday evening and had my first big interview for my show with Graeme Clark from Wet Wet Wet! I said at the beginning of the year in one of my posts that during the year I would love to interview someone and I actually managed it! It was a great experience and it was great to speak with someone who I admire! I'm ever so hopeful that I can get a few more interviews sorted out for 2017! I also had the pleasure of hanging out in The E Street Lounge at Bruce Springsteen's gig in Glasgow for guests of the band etc and got to meet the very awesome Jake Clemons, nephew of the legend; the big man; Clarence Clemons! Jake now plays sax in Bruce's band following the passing of Clarence a few years ago. I remember seeing Jake with Bruce back at my first gig in 2012 and thinking that he was so cool and wanted to meet him ever since so you can imagine the sheer excitement when he walked in the room! I think it's worse when you don't expect it to happen and I completely didn't! We even had our seats upgraded to the Royal Box which was pretty awesome I must admit! We also visited what I would now describe as my honorary home 'Liverpool'-gosh I'd move there given half a chance! And of course it was wonderful to return to some of the iconic places that helped shape one of my all-time favourite bands The Beatles and thanks to Ian our tour guide, I even got to see some more unusual sites-pure bliss for a geek like me! But probably one of my favourite parts was seeing the stage from St Peter's Church Hall where John Lennon and Paul McCartney met for the first time as John Lennon was waiting on the steps to perform with The Quarrymen at the Museum of Liverpool. I'm still so excited that the lady let me touch the stage and have a picture next to it-such a geek aren't I?! And probably one of the other most exciting moments for me this year took place just recently when I had the opportunity to visit the BBC Radio Scotland studios to discuss disabled access at gigs and live events with Kaye Adams. This for me was a dream opportunity and I loved absolutely every second of it! Obviously it was great radio experience but the most important part was discussing a subject which I've been highlighting for as long as I can remember to a wider audience. Hopefully the particular issues that I was there to discuss have been taken on board and rectified. And finally, I turned 18 years old back in September. It's quite a scary thought that I'm 18 already- time just seems to fly by these days! Of course I couldn't not spend my birthday celebrating good music so I dragged everyone to see the new Beatles 'Eight Days A Week' film which included the live red carpet premiere at Leicester Square in London. And of course I even celebrated with a gorgeous homemade cake and of course The Beatles had to be on it! Such a geek right?! Anyway, I won't go much further because I sometimes find myself getting carried away and writing too much. Before I go I want to thank-you all once again for the continual support over my blog and I hope that you'll continue to enjoy what I write in the coming year. I have another new post coming up very soon with my blogging plans for 2017, I have a few ideas in mind which I can't wait to put into action! I wish you each and every one of you a happy new year and I hope that 2017 treats you well! Well, what an exciting start to the week! Throughout my time blogging I've highlighted numerous issues with disability access particularly at gigs and live events. My recent article was a rant in frustration about the lift at the O2 ABC in Glasgow being broken meaning that disabled customers cannot attend events within the venue. I decided to contact BBC Radio Scotland about these issues as I was extremely fed up as nothing ever seemed to change or improve. The BBC Radio Scotland team were kind enough to invite me to visit the studios for an interview on The Kaye Adams Programme to discuss these issues. This for me was a great opportunity to highlight a subject which I've tirelessly discussed here on my blog and feel passionate about. On arrival at the BBC Studios, I was taken aback about just how big the building was! Woah! Imagine working in a place like that!? A dream job in my opinion! The Christmas tree had just arrived in the building and was due to go up. My goodness did it look big! We received our passes from the main reception desk and hung around for a few minutes in the lobby area. After a short while we were escorted upstairs with two other ladies who'd also been invited to discuss various topics on Kaye's show. I was taken aback with just how big the BBC building was; the floors just seemed to keep going! I couldn't help but wonder what wonders lay upon each floor of such an magnificent building! We were ushered through numerous doors, through offices space filled with hundreds of desks of people typing aways and answering telephones. For me, it was interesting to get a small a glimpse into what goes on behind the scenes. I mean this is a dream place to work after all! I'd love to be a BBC radio DJ! How cool would that be!? We were soon taken into what could only be described as a hallway with some seats and what I think was another office space at the opposite end. 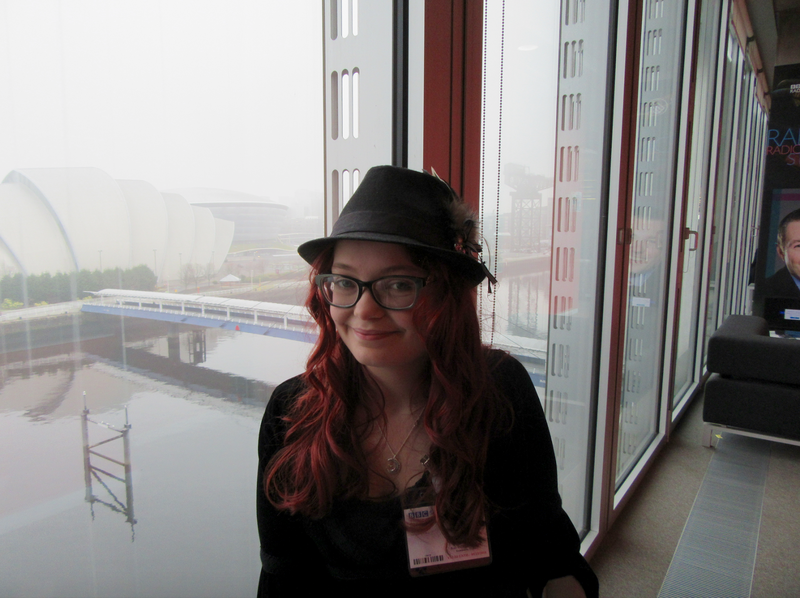 The hallway was lit by daylight singing through the large glass windows looking out onto the river Clyde. Directly across the river was one of my favourite places in Glasgow; the SSE Hydro. Some of my best memories live inside of that building! In front of us in the hallway were the radio studios which had two glass windows; on looked into another small hallway leading to the studio and the other; directly inside the studio. Above the grey door was the 'On Air' sign something that in my opinion makes every radio studio all the more exciting! The first of the ladies was called in for her chat with Kaye about vegan food as we all waited outside. Before long I too was invited into the studio-exciting! I sat down in front of the mic as Kaye was talking with someone via the phone line live on air. It's kind of strange sitting in front of someone you're used to watching on TV. I remember being in Primary school and sometimes being off school ill and often Loose Women being on TV so you can understand why! Kaye started with an introduction about what I was there to talk about and just like that; the interview began. Did I feel nervous? Surprisingly not! I got straight into it and hopefully managed to answer questions with confidence and as much information as possible. I finally had the opportunity to talk about a subject that I feel strongly about and want to help change things so really there was nothing to worry about. I know my subject inside out and was there to give my experiences. And just like that it was over and I went back outside to wait as I'd been ask to stay on and take part in the call-in at the end of the show. As we waited I was introduced to a lady from Disability Agenda Scotland who'd also be asked to come and discuss the subject. Towards the show we were invited back into the studio and the discussion began. Unfortunately, time was running short so the discussion was brief but worthwhile. No sooner than a flash of light, it was over and I'd made my first radio appearance on the other side of the mic and I'm here to tell the tale! I can honestly say I enjoyed the experience so much! It was such a great experience and I would love to do something like that again, strangely there's such a buzz about doing these sort of things! 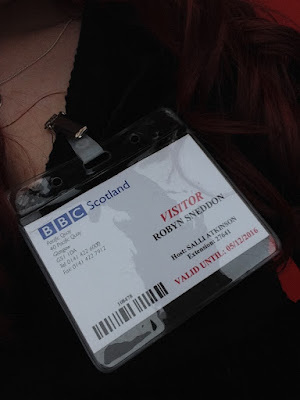 A huge thank-you to Kaye and BBC Radio Scotland for having me on the show and allowing me this wonderful opportunity to discuss this subject on such a vast platform. Every piece of media attention makes such a difference! If you'd like to listen to the interview be sure to click here. My interview with Kaye is around the 1 hour, 50 minutes mark. I'd really appreciate if you could also spare an extra minute to give it a share and help get the word out in the open! So I haven't managed to post a song of the month for the past couple of months (shame on me!) so it's about time I get round to eh?! Well, it's the end of November and December is just around the corner-can you actually believe it!? Yesterday, marked 15 years since a certain gentleman belonging to a band whom I adore so much sadly passed. I was just a small child at the time and have no recollection of the day however I grew up to learn about this legend and his music as a member of two different bands and also a solo artist became an important of my life. It's sad to think that I'll never have the chance to see him perform live. You may not have heard this track before by former member of The Beatles and The Travelling Wilbury's. Considering George's musical catalogue across the years I had an endless choice of songs to choose from to share with you guys. But I decided to choose this more unusual track. Why? I came across this track some time ago after discovering that George wrote this song with alongside the incredible Stevie Nicks. I suppose you could say it's a sequel to the Beatles track 'Here Comes The Sun' and refers to Stevie's love of the moon. It's a beautiful acoustic number that has both George and Stevie's names written all over it. So if you haven't heard this stunning piece of music make sure to click onto the YouTube video linked above and if you have why not have a listen once again and be sure to let me know what you think of it! Anyway sit back, relax and enjoy and I'll speak to you all next month. I can't quite believe it'll be the end of the year-what a scary thought! Have a good few weeks everyone!